It was a cry for help from a parent that made Menslink realise that a growing number of primary school boys were in need of mental health support. Now 10 to 12-year-old boys make up 12 per cent of the male support group’s client case, which CEO Martin Fisk said was not unusual and reflected the national situation. The ACT Government will provide $100,000 over two years to support Menslink’s mental health support program for schoolboys aged 10 to 12 years, enough to fund two new counsellors. Menslink, through its sponsorship program, will match the funding dollar for dollar. “Already we’ve had young guys affected by family violence both as victims and unfortunately as users of violence themselves. We’ve seen young guys suicidal in primary schools largely through bullying,” Mr Fisk said. In the initial case a mother approached Menslink because her primary school aged son was suicidal as a result of family violence trauma that he’d experienced growing up and then the issues associated with moving to a new city. “It struck me that here was a need that wasn’t limited to this one family, that there were a lot of kids in that boat,” he said. Mr Fisk said the decision to offer a service to that age group had been backed by educators, police and other community organisations who saw there was a real need. Martin Fisk announcing the funding from the ACT Government. Photo: Facebook. He said the sooner help could be offered the better, with many young men later in life rejecting assistance when they most needed it. “I have taken so many calls from parents seeking help for their 18-year-old but they won’t accept help. If we get in early we’re embedding that help-seeking behaviour and life skills to build resilience for problems throughout the future,” Mr Fisk said. He said issues were expressed as anxiety and stress or as uncontrolled anger, or violence. “Our service supports these young guys through the issues that are troubling and affecting them, and teaches them simple techniques they can use so their feelings don’t get out of control. The whole family then benefits, as do their classmates and teachers,” Mr Fisk said. Minister for Mental Health Shane Rattenbury said that with half of all lifetime cases of mental illness beginning by age 14, early intervention and access to mental health support services was vital. “We know that boys who have experienced family violence, trauma or peer relationship breakdowns may be at a greater risk of experiencing poor mental health. Working with young people and their families at the earliest possible opportunity can make a significant difference to their overall mental health,” Mr Rattenbury said. Mr Fisk said Menslink could also be rolling out its Silence is Deadly program into primary schools and were employing more volunteer mentors to be role models for boys who did not have a father in their life, suffered separation or family breakdown and were looking for a strong, responsible adult male model to help them guide them through the high school years. 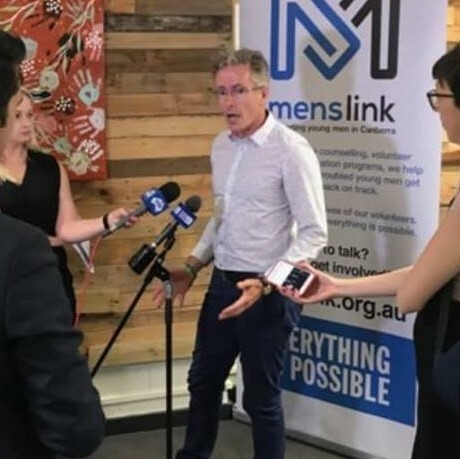 Menslink is a not-for-profit organisation that has been supporting young men in the Canberra region for more than 15 years with free counselling, volunteer mentoring and education programs.